I’m a definite lover of most chicken recipes, and adore Mexican recipes as well. When the two are combined that’s a major bonus for me. I love Mexican flavors, the spices and aromas, and chicken just rocks. 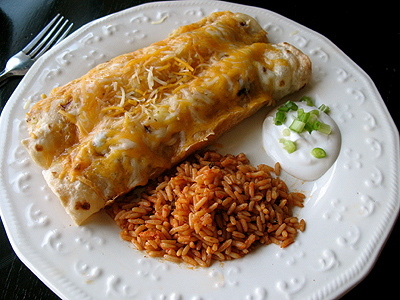 A versatile recipe from Mexican fare is the enchilada. You can make it with a traditional red enchilada sauce, broth bases, ground beef, chicken, pork and of course, there’s shredded beef enchiladas. No matter how you make them they are a wonderful meal you can enjoy at any time of the year! 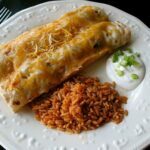 This recipe is part of my Mexican holiday menu that I submitted to the Breakstone’s Sour Cream Blogger Challenge. I have some tough competition, so I hope you’ll vote for my menu when the challenge opens on November 15th! By voting YOU will be entered to win cash prizes as well! Now on to the enchiladas :) These were delicious, yet mild, not overly spicy. A great dish that kids will enjoy and those with sensitive palates will like too. You can make this ahead, all the way up to the part where you put them in the oven. Place the dish in the refrigerator then take out about half an hour before cooking to bring it to room temperature, then bake as directed. If you don’t have time to take it out early, simply add a little cooking time to compensate. Note: For convenience factor and to save valuable time, I used a roaster chicken from the supermarket. You can also make the chicken yourself or use leftover chicken, depending on how many you are serving. If making the chicken yourself, save time by cooking it in your pressure cooker. You can substitute the cheese for your favorite if you like. Also, if you do make the chicken yourself, use the stock that it creates in place of the canned stock in the ingredient list. Serve my classic Spanish rice on the side! Preheat oven to 350 F. Remove meat from chicken and place it a warm dish, keep warm. Combine next 5 ingredients in a saucepan and bring to a boil over medium-high heat. Maintaining heat, cook onion and broth mixture until it's reduced by half, about 20 minutes. Add chicken to broth mixture and simmer for ten minutes to heat through. Remove chicken and onion with a slotted spoon. Reserve about one cup of the broth and discard the rest. Rinse out the saucepan, then add to it the green chiles and the 1/4 teaspoon chili powder; cook about one minute or until heated through. Stir in flour. Cook and stir for one minute more. Remove from heat. Stir in sour cream and 1/2 cup of the cheese. Grease or spray a 13x9 baking dish; set aside. Mic the onion and chicken mixture, if too dry, add a bit of the reserved broth mixture. Divide the shredded meat mixture among tortillas, placing meat mixture along one edge. Top with sour cream mixture and roll up tortillas (they will be full). Arrange in baking dish, seam side down. Bake, covered, for 30 minutes; uncover. Sprinkle with the remaining 1 1/2 cups of cheese. Bake uncovered, 10 minutes more, or until cheese is melted and enchiladas are heated through. Try these tasty Quesados – a Mexican appetizer and finish off the meal with these delicious Mexican Chocolate Sour Cream Cupcakes with Dulce De Leche Frosting! 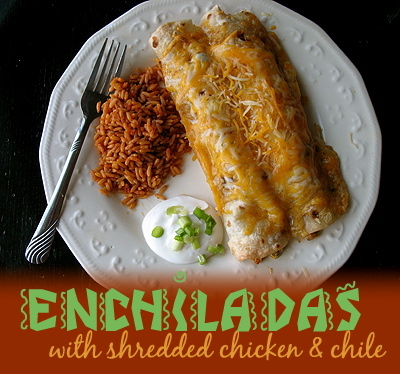 I don’t know how to call these, but these are not enchiladas. Enchiladas are made of corn tortillas, sure, but they also are covered in sauce. Depending the sauce, the kind of enchilada. Sauces don’t have to be always spicy, though the name reccommends it. For example, mole enchiladas are made with a sauce called Mole, green enchiladas with a green sauce, red enchiladas with tomato sauce and so on. The tortilla is fried until soft, and then dipped in the sauce, then filled with the meat, and put in a dish, and if you want, again covered with more sauce, cheese (not cheddar, fresh cheese or if you will put them in the oven one that melts like manchego cheese or chihuahua cheese), lettuce, onion, avocado, and cream. If you don’t want to fry the tortilla, you can just fill them with the meat (or vegetables, cheese like panela cheese or cottage cheese), roll them until they are like tubes, cover them with enough sauce, cream and melting cheese, and put in the oven untill the cheese melts. I would have to agree these are chicken burritos covered in cheese. 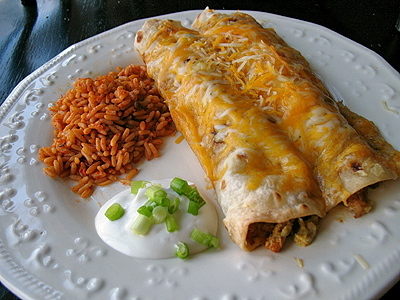 Enchiladas are made with corn tortillas. She used flour tortillas in this recipe. When using corn if you do not lightly fry them the tortilla will become mushy and not hold up. I usually makr strips of sirloin mixed with mushrooms,caramelized fried onions and green salsa. Great real street tacos. Lots of cilantro! Thank you Enrique, great advice! I happen to love corn tortillas, but my family is partial to flour. There's nothing better than a "street taco" with fresh steak and cilantro onion relish on a corn tortilla! YUM!